Iraqis have reacted angrily to a 10-year sentence imposed on a US soldier for abusing inmates at Abu Ghraib jail near Baghdad. 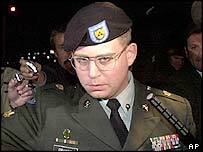 Many said Spc Charles Graner deserved a harsher punishment for his part in the prison abuse scandal. Graner was jailed on Saturday and received a dishonourable discharge from the US army. He said he was only following orders to "soften" detainees for questioning, but prosecutors said Graner was a sadist. The BBC's Jim Muir in Baghdad says with elections only two weeks away, violence wracking many areas and daily life for many people a harsh struggle for survival, most Iraqis have not exactly been following the Abu Ghraib prosecutions with bated breath. But he says, now that the verdict on Graner is out, most of those who are aware of the case believe the sentence should have been tougher. One Iraqi who saw pictures of the abuse on the internet said Graner should be sent back to Abu Ghraib to serve his sentence among the prisoners still there, our correspondent says. Another said that many others of higher rank must have been involved in such systematic abuse and should be prosecuted too, our correspondent adds. Trader Ali Ahmed, 23, said Graner's sentence was "too little, too late. This isn't justice. "Even capital punishment isn't enough. But since it's forbidden to torture him the way he tortured the prisoners, I would have settled for the death penalty," he was quoted by Reuters news agency as saying. But Iraq's Human Rights Minister Bakhtiar Amin told the BBC News website he was "satisfied" that justice was being done in putting abuse suspects on trial. "Those criminals are getting their right punishment, and I believe the American justice system is strong. They brought to justice Presidents Nixon and Clinton - we have never had this in the Arab world," he said. A former military policeman, Graner was pictured abusing inmates in a series of photographs which sparked outrage around the world. The prosecution depicted him as the ringleader of the abusers. Before his sentencing, 36-year-old Graner asked for leniency. He said he was only following orders and that he had complained about the treatment of detainees at the prison. Graner told the jury at the Fort Hood army base: "I did what I did. A lot of it was wrong, a lot of it was criminal. I did not enjoy it." But he said when he complained to superiors he was ordered to do what he was told and to obey military intelligence personnel, who gave orders at the prison. Asked after sentencing if he had any regret, Graner said simply: "There's a war on. Bad things happen."